For a number of years on those "What's On Your List For Next Year" threads, I would write down Neil Burridge's Ewart Park sword (or maybe his Limehouse or Witham swords) but I could never get around to ordering one. I finally bought one and it arrived today. Weight - not sure, but I'm guessing just under 2 lbs. I has a different feel from all my steel swords. Because of the wooden pommel, it has a lot of blade presence, but it is still very maneuverable. Of course, it should be used with a shield, and is very much an offensive weapon. When I wield it, cutting feels very natural, but it also seems to favor an underhand thrust. It is a beautiful sword, the first bronze in my collection. 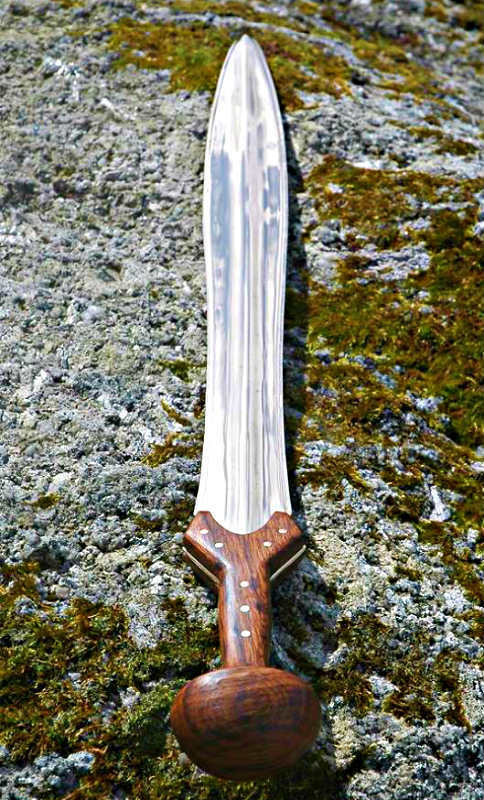 The Ewart Park swords that Neil has been making lately are a little different from the one that appears on his website. This one has a central ridge down the blade with a slight depression accompanying it on each side. Here are a few photos that I took, the best I could do. The sword didn't want to be photographed. Gorgeous. He's really putting out some amazing work lately. I never get tired of seeing Neil's work. Welcome to the Ewart Park Club! (Though I guess we should be a "society", since we don't want anyone to think that "club" implies anything about the weapon itself!) That's definitely a lovely one. And yes, it's very hard to photograph polished bronze! I usually have to do a lot of Photoshopping to avoid "black with glare"... So nice job on those. Fantastic! That wood in the handle is as deep and rich as the sword is shiny! For photography, I always recommend natural lighting on an overcast day. Congrats on the awesome acquisition! If theres a Neil Burridge bronze sword club I joined it a few months ago with an Ewart Park sword and a scabbard from Steve Herta. Welcome to the club, Marty! Nice work on the scabbard. 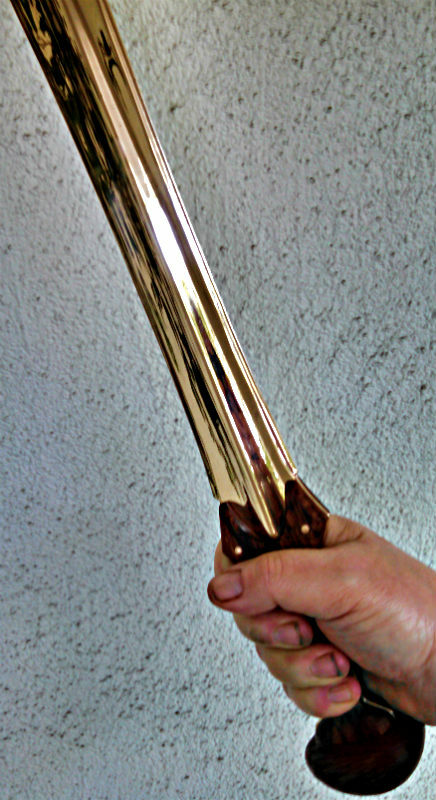 I had some beautiful bronze age inspired scabbards custom made as well, by Sonny Suttles who did a superlative job. I notice that you have Neil's most updated design of the Ewart Park. Quite beautiful, and great handle. Did you create that yourself? I'm guessing that the more pronounced central rib grants more structural stability to the blade, though perhaps at the cost of cutting ability? (That is, if the cut is drawn through the blade, as YouTube Thrand tested with another of Neil's designs). Did Neil happen to communicate to you as to why he changed the design (which has been evolving over the years, as it were)? Just curious. If you don't have a pronounced medial ridge, it is very hard to cast the blade without voids. When being used in combat the pronounced ridge limits the depth of a cut. This can be both good and bad depending on what you are trying to achieve. The work that Neil did for Marty and Roger is beautiful. Dan or anybody else, I was wondering what you think prompted the changes in the design, because it looks like the Ewart Park has evolved over the years as Neil continues to tweak the sword. My own Ewart Park, and others, have a less pronounced Central Ridge. I’m wondering if other archaeological finds have been discovered to prompt the change, or if this is a result of more modern experimentation for utility. The period examples that I have seen iseem to follow Neil’s older design. But there certainly are a lot of other original examples out there!